(CNN) -- A goal deep in injury time from Danish substitute Christian Poulsen gave 10-man Juventus a vital 2-1 win at Catania on Sunday, keeping alive their slim hopes of winning the Serie A title. 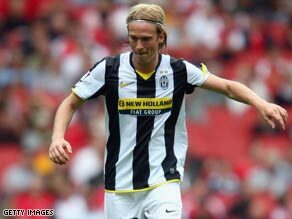 Christian Poulsen proved the match-winner to keep Juve's slim hopes of Serie A title glory alive. The last-gasp victory lifted Juve above AC Milan into second place in the table, behind defending champions and leaders Inter by seven points with 15 matches remaining. The visitors took an 11th minute lead when Vincenzo Iaquinta was left unmarked six yards out to head home a Mauro Camoranesi free-kick. However, Iaquinta's celebrations were cut short when, just 90 seconds later, he was sent off after receiving two yellow cards. The Italian striker was initially booked for removing his shirt while celebrating his goal and then -- within seconds of the restart -- he went into a challenge with his studs up and earned a second yellow card in quick succession. The Sicilians levelled seven minutes after the break when goalkeeper Gianluigi Buffon made a great save from Giuseppe Mascara's header, only for Takayuki Morimoto to follow up and score from the rebound. Despite their numerical disadvantage, Juve poured forward late on and Amauri headed Nedved's free-kick back across goal for the unmarked Poulsen to poke home the winner. Elsewhere on Sunday, Fiorentina moved up to fourth in the table when Alberto Gilardino scored a last minute winner against 10-man Lazio, who had Lorenzo De Silvestri sent off in the first half. Lazio goalkeeper Fernando Muslera failed to hold Adrian Mutu's shot and Gilardino swept home the rebound to condemn Lazio to a fourth successive defeat. Roma moved into fifth above Genoa on a better head-to-head record after beating their Champions League-chasing rivals 3-0 at the Olympic Stadium thanks to goals from Brazilians Cicinho and Julio Baptista and Montenegro striker Mirko Vucinic.